The United States Mint offered the 2012 Platinum Eagle in numismatic format only. For the fourth year in a row, the bullion versions of the coins were not offered. Production had initially been suspended in late 2008 and never resumed. Under the authorizing legislation for the series, there is no requirement to produce the coins each year, rather it is at the discretion of the Secretary of the Treasury. Despite the absence of the bullion versions, the numismatic series had continued uninterrupted. 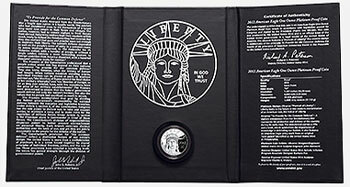 The 2012 Proof Platinum Eagle was available in one ounce size only and represented the fourth design within a six year series presenting the core concepts of American democracy as found in the Preamble to the Constitution. The designs for each year were inspired by narratives written by John G. Roberts, Chief Justice of the Supreme Court. The theme for the reverse design was “For the Common Defence.” The spelling of the word “defence” was based on the original Preamble, as opposed to the common modern spelling of the word “defense.” The design by Barbara Fox featured a depiction of a diligent minuteman from the Revolutionary War era. He stands in protection and defense of the country during its early days holding a rifle and book. This is intended to symbolize the importance of knowledge in protecting the country. An American Eagle privy mark appears within the border of the design. 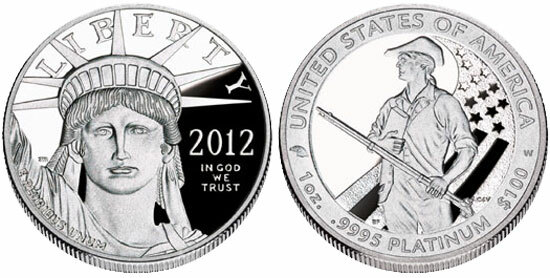 As with all previous issues of the series, the obverse design carried the portrait of Liberty based on the Statue of Liberty and designed by John Mercanti. Sales of the 2012 Proof Platinum Eagle began at the United States Mint on August 9, 2012. A maximum mintage was established at 15,000 coins, which was the same level as the previous year. An initial ordering limit of five coins per household was imposed but later removed. The initial price for each one ounce proof coin was $1,692. The price level would fluctuate throughout the course of the offering based on the average weekly price of platinum. Opening sales for the offering were significantly lower than recent prior year, with 2,461 units sold in approximately the first week of availability. Through the end of the calendar year, sales reached 7,477 out of the 15,000 maximum. The coins remained available for the entire subsequent year until concluding on December 31, 2013. The issue had a final audited mintage of 9,081 pieces, falling below the levels of the two prior years.